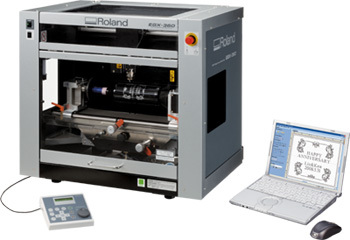 Roland is pleased to announce the NEW Roland EGX-360 Gift Engraver. The Roland EGX-360 engraving machine is the ultimate gift engraver for stunning corporate gift, award, signage, rhinestone template creation and much more. The Roland EGX-360 is easy to use and is one of the safest gift engravers on the market due to its integrated safety cover. The EGX-360 offers features only found in higher priced gift engraving systems. The EGX-360 is geared towards the gift and awards customer as well as jewelers and even wineries and wedding houses to produce customized products for their clients. The compatibility with Roland R-WearStudio, EngraveLab and FlexiEngrave allows you to use the Roland EGX-360 engraving machine to produce everything from custom rhinestone templates for gift items and apparel to ADA and indoor signage. The EGX-360 Gift Engraver may be the last engraver a customer will ever need. 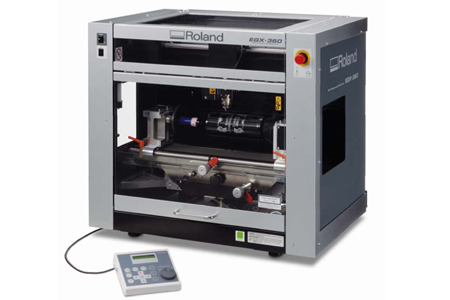 The new Roland EGX-360 engraver includes features that raise engraving capabilities to a whole new level. The EGX-360 engraver includes a flat engraving table that allows the user to engrave large flat objects up to 12 in x 9 in. The flat table is ideal for engraving applications like name badges, safety signs, ADA signage and R-Wear rhinestone motif templates. The optional ring attachment allows the user to engrave the inside and outside of rings. The ring attachment can accommodate inside ring engraving diameters from 0.51 in. to 0.94 in. (13 mm to 24 mm) and outside ring engraving diameters from 0.63 in. to 3.31 in. (16 mm to 84mm). When engraving high end gift items like glass, crystal, gold and silver the last thing you want to do is make a mistake. The Roland EGX-360 gift engraving machine has an integrated laser pointer which allows you to set the engraving area easily by referencing 2 diagonal points. The machine will then set the origin to the center and can also feed that information back to the software or Windows print driver. The EGX-360 engraver also has a preview function so that the customer can preview the job with the laser pointer to ensure that the machine engraves in the proper area. 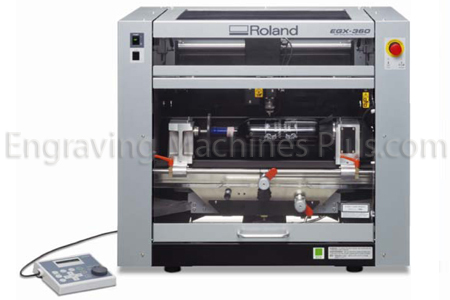 The Roland EGX-360 engraving machine includes an environmentally friendly recirculating water system for use when engraving glass, crystal and marble. The water is needed to keep glass debris and tool friction to a minimum. The system uses plain tap water which is environmentally friendly and the filter is used to captures the glass particles which keeps the system running at an optimum level. The system also has an easy to use drain hose when switching out the water. Bundled Roland EngraveStudio software facilitates the production of a wide variety of jobs, from wine bottles to rings and luxury gift items. With single stroke fonts and a special V-Carving mode, EngraveStudio generates quality results with a real hand-carved look. The software imports designs in AI and EPS file formats, and lets users preview them, saving precious materials and time. It also has an automatic detection feature to automatically read back the material size information from the EGX-360. Dr. Engrave is an entry level engraving package that uses TrueType fonts and includes an automatic layout function for importing Excel and CSV database files for fast engraving of product serial numbers and nametags. The software quickly and easily imports data and places columns of information into pre-defined text boxes to produce corporate nametags for an entire door-numbering project. Dr. Engrave is compatible with Windows 2000/XP/VISTA. 3D Engrave allows you to produce 3D reliefs from a 2D object to produce stunning 3D signs without the need for additional software. Virtual MODELA enables simulation of finished shapes created in 3D Engrave for previewing on your computer screen before beginning production. Virtual MODELA also calculates the time it will take to output a job based on the parameters set in 3D Engrave. The EGX-360 engraving machine is currently the only gift engraver on the market that includes a safety enclosure. The safety cover cuts down on the noise level, debris and water splash. It also uses a damper type structure for smooth open / close operation which makes the Roland EGX-360 ideal for retail environments as well as those looking for safety when purchasing a device. USB connectivity allows for quick and easy connection to the PC. The EGX-360 supports Windows 2000/XP and VISTA (32 bit edition). If anyone out there has any doubt about which machine to buy and how exactly to use it, your in the right place ! You are hearing from an absolute engraving machine software rookie. No experience whatsoever. Daniel has a great system of explaining each procedure why and how. The reason I'm writing this is because I just erased all data on my computer, EVERYTHING !!! I went back to my notes from Danny and I was back up and running my EGX-360 shortly !!! You owe it to yourself to spend some time with Danny, if you don't you'll be wasting your time! Thanks a ton Danny! We were very pleased with our EGX-360 Engraver. My experience with Engraving Machines Plus has been a great one. My agent Danny, has been vital in training and questions that have come up in using the machine. We had an onsite trainging that was very successful. I took away a good amount of confidence in using the machine right away. The customer service has been great as well. I would reccommend using this company for your engraving needs. EGX-360 ES UNA MAQUINA COMPLETA QUE TE BRINDA INFINITAS POSIBILIDADES,SOLIDA Y FACIL DE MANIPULAR. EL SOFTWARE MUY COMODO Y CON HERRAMIENTAS QUE IGUAL TE BRINDAN UN SIN NUMERO DE OPORTUNIDADES A LA HORA DE DESARROLLAR UN DISENO. EN GENERAL EGX-360 HA SIDO PARA NOSOTROS DE MUCHA UTILIDAD Y CON UN EQUIPO DE TRABAJO QUE TE RESPALDA CON UN ENTRENAMIENTO INCREIBLE Y SERVICIO TECNICO A CUALQUIER HORA. This training was very good and customer service was very nice. They explained everything completely answering all questions that were asked without a doubt. The EGX-360 is a very easy to you use machine, the software is just a point and click system. If i were in need to get another machine, I would get another and refer anybody to this company.